Doubletake is happy to announce their new client — The First Airline Monument Project. Something happened over 100 years ago in St. Petersburg, FL on New Year’s Day in 1914 that would change life as we know it forever: The first commercial airline flight took off out of downtown St. Petersburg and landed 23 minutes later in Tampa, a shorter commute time to our neighboring city than any other form of transportation at that time (commuting from St. Pete to Tampa or vice versa took hours by automobile or train). The brave pilot of this monumental flight was named Tony Jannus. He was chosen by Percival E. Falser, a Jacksonville electrical engineer, and Thomas Benoist, the manufacturer of the airplanes and airboats. Jannus was chosen for this great feat due to his evident skill in flying. The community came together to raise money and the St. Petersburg Mayor at the time, Abe Pheil, was the first passenger of the first airline. How much does one bid to be the passenger of a trailblazing event? $400, to be exact, that being $10,000 today due to inflation. DoubleTake is more than thrilled to announce our partnership with First Airline Monument Project, a 501(c)(3) dedicated to erecting a public art piece in memoriam of one of the biggest parts of St. Pete’s history: The flight of the first commercial airline by Tony Jannus. 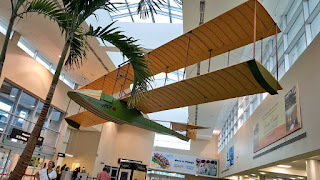 You’ve seen replicas of the Benoist flight all over Tampa Bay: In the Saint Petersburg Museum of History, PIE Airport (pictured below), etc., but never a breathtaking statue created to honor this moment in our beautiful city’s history that makes us who we are today on the waterfront, several footsteps away where the airboat actually took off over one hundred years ago. Before the Benoist could even leave the ground, the flight needed funding and support from the good people of Tampa Bay. Because of everyone’s ability to come together and support something for the better good of all at the time we are able to access airlines so easily today. Without your help, there is no way to honor our city’s profound and unique history. Donate today by going to http://www.airlinecentennial.org/sponsorship–donations.html or reach out to the DoubleTake team about how you can help.